Former Bad Boy/Arista Records recording artist, rapper Shyne, now a free man, is returning back to the hip hop scene just two months after walking out of prison in October ‘09 after serving eight years on a 10 year bid (sentence) for his role in a 1999 shooting at a Manhattan club in New York. The rapper is expected to be working with music producer Scott Storch who unveiled the news. BEEF STEW: Raekwon, Benzino, and Royce da 5'9"
AZ wants the world to know that the back-to-back releases this past June of Legendary and G.O.D. (Gold Oil And Diamonds) were not intended to be viewed as part of the formal Visualiza discography. CLICK here to DOWNLOAD Wale's freestyle, "Thank You"
Download Joell and Frequency's new mixtape, "Road Kill"
Seemingly low first-week sales, and a mixed reception from critics, hasn’t deterred one-half of the Thornton brothers, Pusha T, from touting the inarguably impressive performance of his big brother Malice throughout Clipse’s new album, Til The Casket Drops. NEW VIDEO: Rhymefest - "GIVE IT TO ME"
After a nine-year wait, Oakland hip-hop group Souls of Mischief has released its fourth CD. 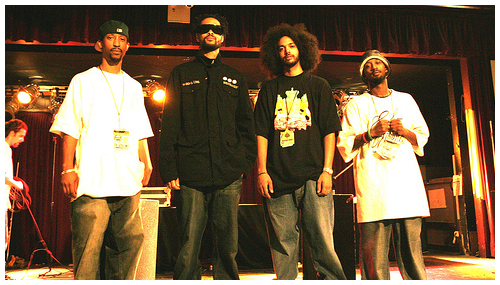 Since "Trilogy: Conflict, Climax, Resolution" came out in 2000, three of the four members have released solo albums, all four have released mix tapes, and they have toured extensively as a group and as solo artists. What's Birdman gotta say 'bout Drake? 50 Cent recently took more shots towards Jay-Z, saying more about how he disagrees with his business practices. 50 has been taking shots at Jay as of late and this has allowed speculation regarding Beanie Sigel joining G-Unit to grow. He also adds that Jay-Z made him not shoot his videos with Freeway. DOWNLOAD "Smoke DZA - Substance Abuse"